Remove outer hard shell of the chestnuts and place in a medium saucepan. Fill with enough water to cover the chestnuts, and boil for 15 minutes. Drain and finely slice. Combine cornflour and water in a small bowl and set aside. Place chestnuts, chicken, spring onions, shiitake mushrooms, garlic, cabbage, carrot, soy sauce, sesame oil and ginger into a bowl and mix well. Place 1 wrapper on a board with a corner pointing towards you. Brush the edges with the cornflour mixture. Spoon 1 heaped tablespoon of the spring roll mixture into the corner of the wrapper. Fold the corner over the filling, then roll up from corner to corner, folding the edges in to enclose the filling. Repeat with the remaining wrappers and filling. 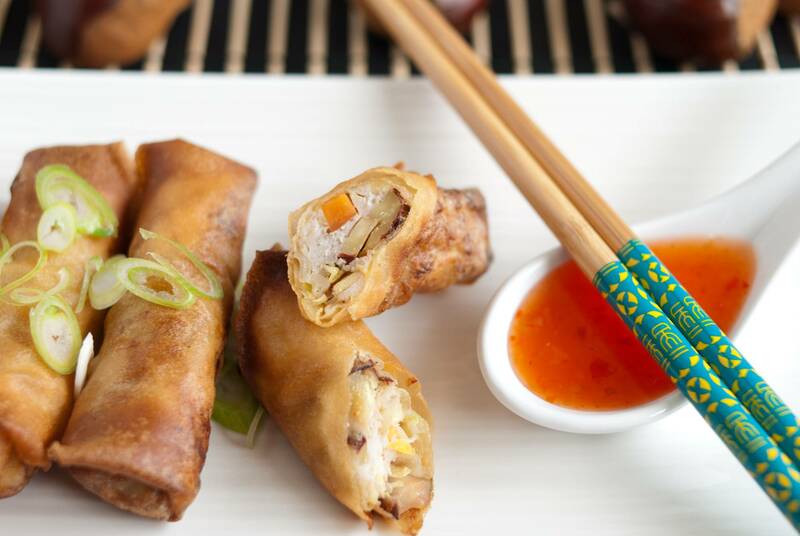 Deep fry the spring rolls by using a deep fryer or; pour vegetable oil into a wok or small saucepan until one-third full. Heat until a small piece of bread dropped into the oil sizzles. Place spring rolls into the oil in batches for 3 to 4 minutes, or until golden brown. Remove and drain on paper towel. Keep warm in the oven while cooking the remaining spring rolls. Serve hot, with sweet chilli sauce.